The choices we make have a ripple effect. Let us never think otherwise. We read about people throughout time who have, by their words or actions, affected those around them - for good or for ill. Most of us can remember both kind and unkind things said to us as children. Those things remain with us and the hurtful ones stay with us until we forgive and let them go. The positive things encourage, strengthen and often help us want to become better. 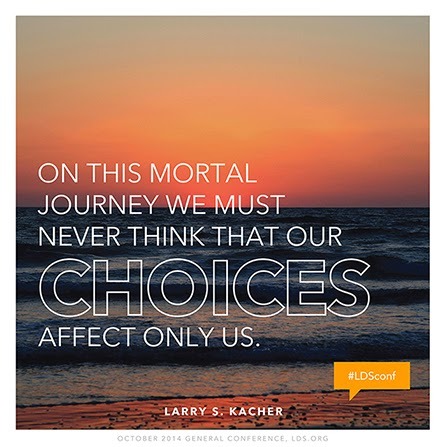 "On this mortal journey never think that our choices affect only us." This is one of the great lies of the adversary (father of all lies). He seeks to make all men miserable like unto himself. He wants us to believe the worst about ourselves and others and to think that we can do whatever we want (selfish) and that it won't affect anyone else. That's just not true. Whatever we do is felt or sensed by those around us. It affects how we feel about ourselves and then, how we treat others. We cannot live in sin and be at peace. A smile, a kind word, a pat on the back, love given through service or prayers etc. blesses and strengthens those around us. We may watch a marathon and see those on the sidelines cheering the runners on. Let us do the same for all who run the race of life. In that way our choices can affect one another for good and, then, ripple on forever.